Painting rooms in a home can be a do-it-yourself project. Armed with paint, tape, tarp and some brushes, there’s nothing you can’t re-color. While some rooms call for a complete sand-down, there are some that don’t, and for those, Rule #1 is that your walls must be stain-free before adding the next coat of paint. Stains can come in all varieties and the most basic stains can be treated with a damp rag or a Mr. Clean Magic Eraser. For everything else, you’ll need a more cleaning power. For example, of all the stain-types, “grime” is the most common. To remove ground-in dirt and oil, start with 1 gallon of warm water in a bucket, then add 1 cup of ammonia, 1/2 cup of distilled white vinegar, and 1/4 cup of baking soda. Rub gently and follow up with a clean water rinse. Permanent Marker : Blot the stain with a rubbing alcohol-soaked cotton ball. Allow to air dry. Mildew : Add 1 tablespoon of vinegar to 4 cups of water. Spray and allow to air dry. Crayon : Dust a damp sponge with baking soda and scrub. Baby wipes work, too. If your wall stains are “water stains”; the result of a leak or something similar, make sure the water source is corrected prior to painting. Then, to remove spots, mix 1 part bleach to 4 parts water, thoroughly rinse the stain, and use a hair dryer to dry the solution on the wall. 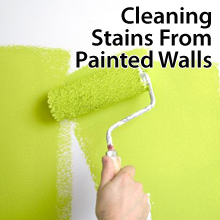 Once cleaned, your walls are ready to paint.